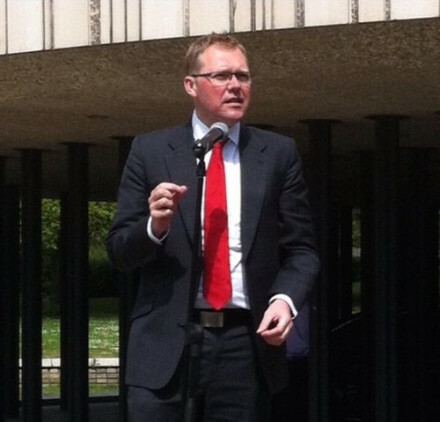 Leader of Newcastle City Council Nick Forbes was this weekend elected to succeed Jim McMahon as leader of Labour’s Local Government Association (LGA) group. The result was announced at the party’s Local Government conference in Nottingham, after voting by English and Welsh Labour council groups closed last Thursday. Forbes, who is widely seen as a ‘moderate’ within the party, was elected with 68% of the vote on a 74% turnout. He will present a report on local government to Labour’s NEC next month, and there are some moves to allow the Labour LGA leader to attend all NEC meetings, but not as a member with voting rights. Forbes predecessor Jim McMahon, who stood down after being elected MP for Oldham West, was a councillors’ representative on the NEC, and has been replaced in that role by Coventry City Council’s Ann Lucas. Since McMahon stepped down as LGA Labour leader, a position which as a councillors’ representative to the Government and the Labour front bench, Steve Bullock and Sharon Taylor have filled in as interim leader. Forbes will represent over 6,000 Labour Councillors and 371 Labour groups. He said Labour councillors should be guiding the party nationally in the way they respond to Conservative policies. “It is Labour councillors across the country who see daily the impact of austerity, and their efforts to shield our communities from the worst of this should help guide our party nationally. Across the country our councils form the front line in the battle to safeguard services and my job will be to work with them as we unite in the face of Government spending cuts. Jeremy Corbyn said councillors and MPs must work together to fight the Tories.